When life consumes so much time, it can be easy to underestimate the importance of selecting the proper toys for pet birds. Birds require daily intellectual stimulation, and, when their owners are away or busy, their cages restrict the engagement that is possible in the larger environment of a home. The simple fact is that too often pet birds are left to entertain themselves for extend periods of time. Bored birds often engage in self-destructive behavior such as feather plucking and can grow irritable and aggressive. Parrot toys can help to replace bird boredom with activities which the exercise the mind and body, while helping to minimize unwanted behaviors. Toys for specific types of birds (like Parrot toys) should be carefully selected to stimulate healthy activity while keeping birds safe. For almost all breeds like finches, parakeets and larger birds like parrots-toys are a great investment into a bird's overall health, keeping both birds and owners happy. Parrot toys, finch toys, parakeet toys, in fact toys for all breeds can fill a crucial void in a bird's life. Companion birds often don't have the opportunity to participate in the activities their wild relatives do. Avian behaviorists recognize that play ranks second only to food gathering in importance to birds. Companion birds still possess the natural desires to forage, explore and chew. Toys, like a parrot toy, serves the bird's desire to forage, build a nest or play with other members of its flock. Parrot toys, finch toys, parakeet toys, etc. provide excellent channels for birds to expend aggression. When birds are occupied and active throughout the day, they won't feel the need to act out aggressively towards their owners or destroy furniture when they are let out of their cages. To a larger bird like a Macaw parrot, a toy can encourage many different forms of exercise including wing flapping and swinging. Active birds tend to be healthier and live longer. Toys for parrots, finches, parakeets and other breeds can also keep a bird's beak and nails trim and encourage foot exercise with time off of perches. Interacting with a variety of toys when parrots and other breeds are young helps them develop learning skills in captivity. For example, toys help parrots and other birds discover colors, textures and shapes while learning coordination skills and gaining confidence in movement and exploration. Regular playtime is crucial to mental health because it helps birds feel more independent and satisfied. Chew toys are designed to be quickly destroyed. Birds obtain satisfaction with tearing these toys apart as soon as they are placed in their cages. Chew toys will be removed regularly as they are destroyed. They can be made of soft woods, leather, soft plastics or paper. This category of toys is more durable. Although all toys should be cycled out to maintain interest, some toys are designed to be a permanent presence in an owner's parrot supplies cabinet. These toys can be made out of hard plastics, acrylic, PVC or metal. Larger birds, like Amazons or Macaws may require more durable toys since their beaks are stronger and more likely to quickly destroy anything made of lower-quality materials. Introduce safe toys early in a bird’s life. Change toys regularly to maintain bird interest. Inspect toys for signs of wear that may harm the bird. Regularly disinfect toys to prevent the spread of bacteria and illness. Because some toys can frighten birds, watch for signs of distress and inspect toys for characteristics that may upset birds. Use the parrot toy to interact and play with the your parrot, a finch toy for a finch and so on. Avian experts agree on the physical and mental health benefits of parrot toys, finch toys, parakeet toys, etc.. Birds without access to cage toys and those that never experience daily environmental stimulation develop boredom, depression and experience a decline in physical health. The dollars spent on entertaining parrots with parrot toys and other breeds will exponentially reduce the dollars spent on future vet visits or treatments of health problems. Toys are worthwhile bird cage accessories, and wise, caring owners ensure they are a regular part of their birds’ daily living. Bird-cage.com offers a variety of toys for all sizes of birds. 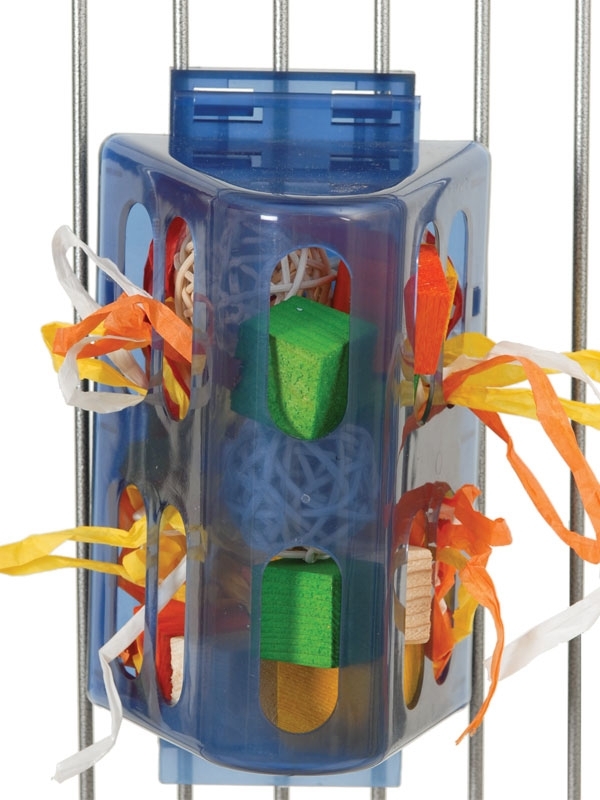 The Bird Cage Fun Pack is designed for smaller birds and contains several favorite toys recommended by bird owners. It includes the Deluxe Ball Chew 'n Shred, the Surprise Drum and the Hanging Sun Chips. 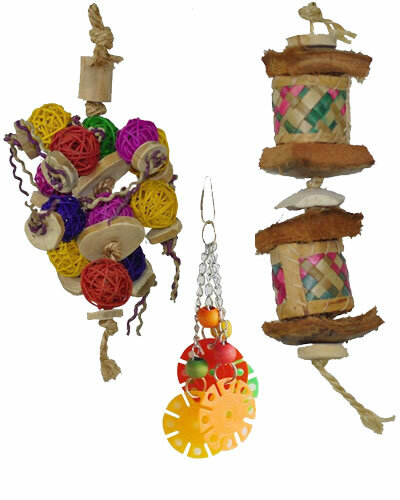 Each of these parrot toys offers birds different forms of stimulation and entertainment. Other breeds reap similar benefits. The Treasure Chest is one of many foraging toys available at bird-cage.com. This parrot toy hangs on the side of a cage and holds many brightly-colored chew toys. Birds are able to see through the chest, which encourages them to dig for the toys, keeping them busy and promoting exercise.